Wishing all a peaceful, inspiring, creative, magical and fulfilling 2016. P.S. Don’t forget to take a morning in the next few weeks to awake before dawn and check out the stellar lineup of planets visible on the eastern horizon to the naked eye! Personally, some of the greatest motivations for me this winter have been reading Elizabeth Gilbert’s BIG MAGIC (check out her Big Magic Guide here with some great exercises for you to do right away! ), Heatherash Amara’s Warrior Goddess Training: Become The Woman You Are Meant To Be, the unfortunate passing of many musical icons (especially David Bowie, triggering deep reflection on mortality, magic, and creativity via Blackstar), and numerous long walks in nature, taking time to listen to the wisdom of Gaia. 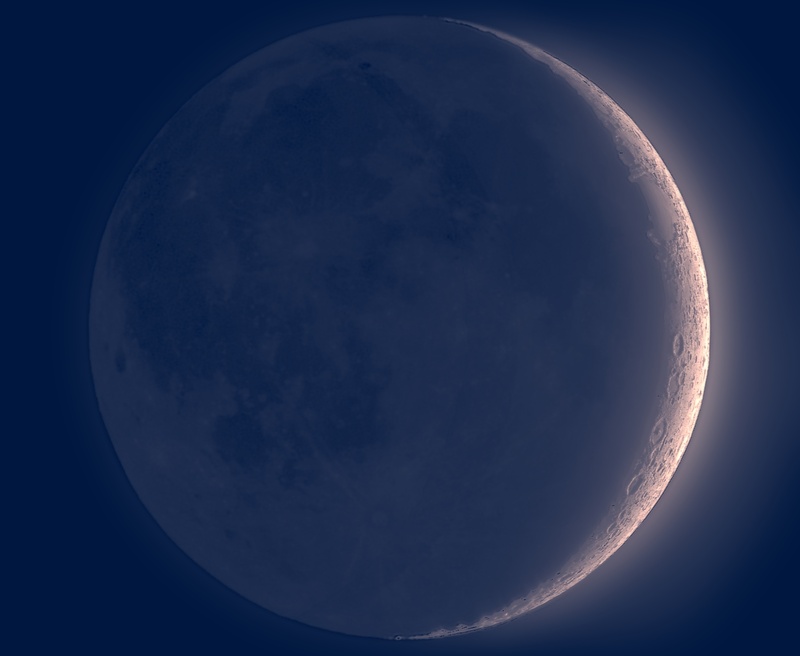 After much purging/release at Samhain, and a contemplative, transitional Winter Solstice, insights and breakthroughs have been coming like lightning flashes of divine inspiration! Soulful songstress Amy Clarke crafts powerful vocal & piano-driven music with lyrical depth, consciousness, and *magic*. Skillfully blending classical training with modern influences, she is a dynamic and compelling stage presence – whether solo acoustic, experimenting live with guest artists, or mixing effects on her synth keyboard. Her own label MAAT Music references the Egyptian goddess of truth, justice, and balance. As a creatrix, oracle reader, and priestess of the moon, Amy brews music, healing arts, ceremony, & nature into a promising and potent alchemical blend. 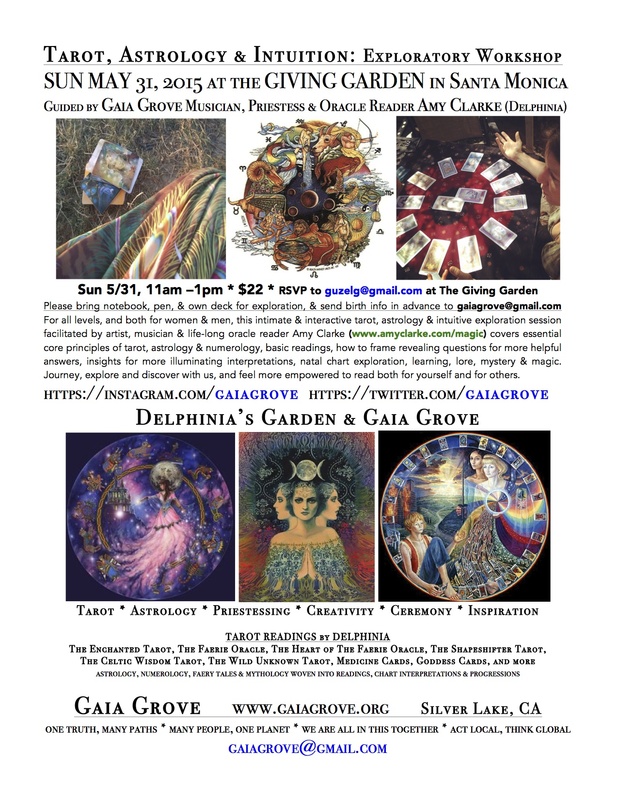 While primarily a solo artist, Amy enjoys experimenting with other musicians and artists, at times producing unique concerts and events to benefit sustainable non-profits and local organizations with her evolving collective GAIA GROVE (www.gaiagrove.org). Amy has opened for and shared stages with a diverse & inspirational collection of artists and projects including Starhawk, Poe, Amanda Sage, Occupy Love, Dave Greene (Tom Petty & The Heartbreakers, Joe Walsh, Steve Ferrone Band), La Palabra, played an impromptu set at Lilith 2010 in Irvine, CA in the Yamaha tent, and was appointed the Nettwerk Social Media Ambassador by CEO Terry McBride for the penultimate Lilith concert in her hometown Washington, DC. Inspired by many muses, Amy has interviewed Tori Amos, Sarah McLachlan, the Indigo Girls, and more in person on creativity, songwriting, and touring, and she has shared her own music and taught workshops on creativity, sound healing, astrology/tarot and more from major festivals (Sacred Spaces Village, Burning Man, SXSW, etc) to local collectives, schools and community gardens (primarily Micheltorena Garden in Silver Lake, Los Angeles). 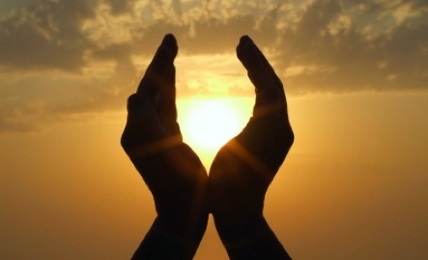 Amy is also a Priestess with Reclaiming, has been published in the Reclaiming Quarterly, has shared her work at the International Alchemy Conference. Since independently producing and releasing her debut After The Fall EP mostly from her laptop in Williamsburg, Brooklyn in 2006, Amy’s music has been featured on national, cable & internet TV; FM Radio, internet radio, Sirius Satellite Radio, she has been interviewed on TV & radio and local press, and performed in countless high-profile gigs in both top NY/LA/DC venues (see below) & on festival circuit (SXSW, Burning Man (twice), LA Burning Man Decom (3 times), San Diego Burning Man Decom, South Park Music Festival, Temple of Visions, Cross Pollinate, & Sacred Spaces, to name a few). Amy earned a Certificate in Electronic Music Production from SAE-NY in 2005, and has also received 5 ASCAP Plus awards for songwriting. Amy released the single “MARY (her story)” in 2009 as a preview from her future album, and followed that up with the Winter Solstice 2012 release of “We Are The Web”. She now plans to release her full album in 2016, along with another new project. In New York City, Amy has performed at The Cutting Room, The Bitter End, Rockwood Music Hall, Pianos, Rose Live Music, CBGB’s 313 Gallery, Marion’s on the Bowery, Mo Pitkins House of Satisfaction, Caffe Vivaldi, The Triad, The Duplex, P.S. 122, M Shanghai Den (Williamsburg residency), BAP (Bushwick Art Project), Hope Lounge, and in events for Tree People, Direct Relief, Theatres Against War International, Planned Parenthood & Habitat for Humanity International. Amy has also starred Off-Broadway and been featured and interviewed on television, Sirius Satellite Radio, and cable. In Washington, DC, she has performed at the Studio Theatre, Georgetown University, Catholic University, The National Theatre, and from the indie underground scene of the Black Cat and The Red & The Black all the way to The White House. Amy has been selected as Artist of the Month at Busboys & Poets U St and was featured at All Souls Unitarian Church, 16th St, DC. In Los Angeles, CA she has performed at The Viper Room, Hotel Cafe, The House of Blues, Temple of Visions, The Big Art Church, LA Burning Man Decompression Festival, Playhouse, King King, The Silver Lake Picture Show, Sunset Triangle Plaza, Los Globos, Genghis Cohen, El Cid, The Derby, Tangier, The Verity Room, MethodFest Film Festival, Burbank International Film Festival, Los Angeles Convention Center, LA State Historical Park, and has opened for Starhawk three times at Fais Do Do. 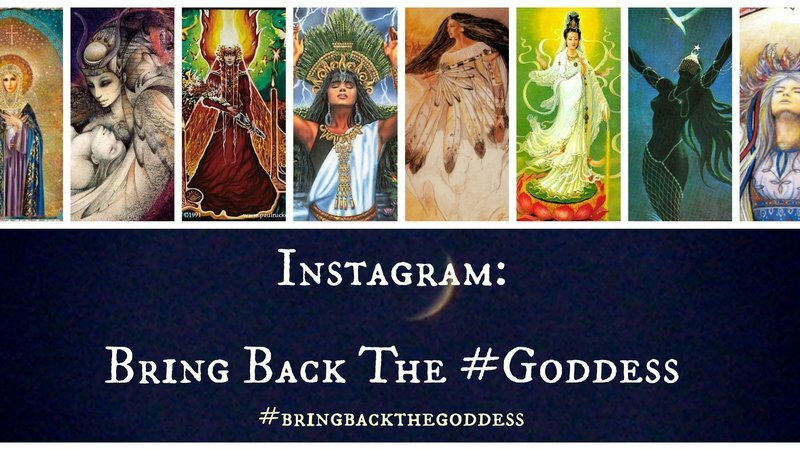 There are so many wonderful articles and blogs on the recent Instagram ban of #Goddess I have compiled many of them here. 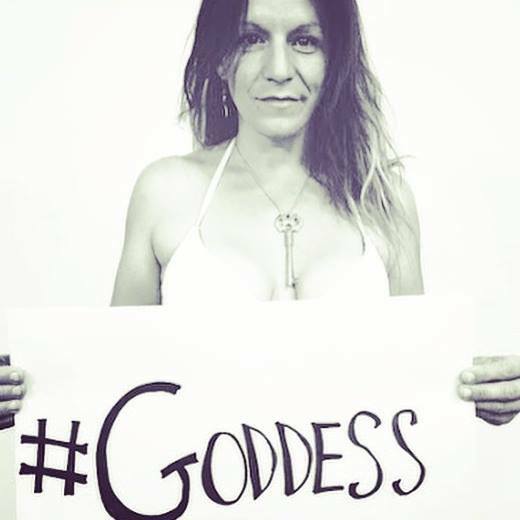 Thanks to LA MOTHER for doing the art campaign in May to reclaim derogatory language that led to me choosing the hashtag #goddess so the picture above was taken, as it was featured in the Daily Dot blog and is getting traction and awareness on Instagram at present. Sign the petition at Change.org. Spread the word. <<The use of hashtags on Instagram has become a new way for social media lovers to gather and search for information. Most of these popular hashtags seem harmless, but there are a few that are problematic. To make sure the app is being used in a safe way, controversial tags are blocked or given a “Content Advisory” warning message. While it’s clear why certain questionable hashtags would be suspended, we were incredibly confused when earlier this month the app decided to ban the body positive hashtag #curvy. Instagram users were not happy with the eliminated hashtag and fought back by using #curvee, #stillcurvy, and #bringbackcurvy instead. Eventually Instagram came to realize that the hashtag was being used to celebrate the female body and lifted the ban. Unfortunately, Instagram decided to surprise us once again. The photo sharing app decided to ban the hashtag #goddess. Meanwhile, #god remains securely intact. The common thread in each of these hashtag removals is that all of them are directed towards women. Instagram’s policy is not only weirdly enforced, I think they’re trying to have a simple policy that makes it easy for them …. Women are really bothered by the predatory invasion of their bodies … That includes posts of their body parts without their permission and the banning their own images because they don’t conform to an ideal physique. As Steiner suggests, many of these bans, and related deleted photos, directly involve the display of female bodies and women’s sexuality. And, that has been the crux of the problem. While Instagram is trying to protect women and curb violations against women’s bodies, it is also censoring women and their positive expressions of female sexuality, spirituality, agency and body-positive imagery. 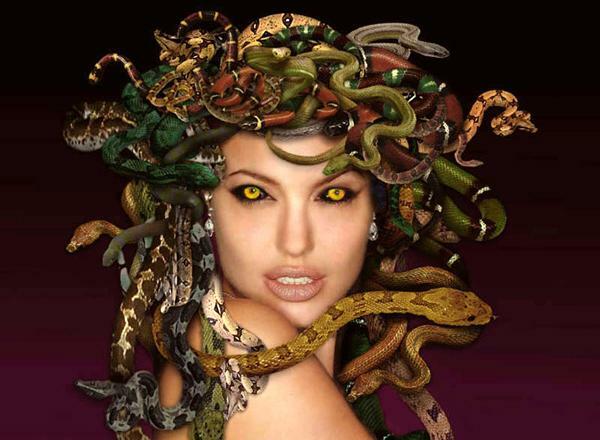 Medusa (Dark Moon, Crone, Snake Goddess) was one of three Goddesses divine to the Libyan Amazons known, along with Athena (New Moon, Virgin, Warrior Maiden) and Metis (Full Moon, Mother, Sea Goddess), and in ancient Libyan myths, this Triple Lunar Goddess rose from the water as Anatha. In the meantime, save the date for LAMother Exhibition Preview (REscheduled) next Saturday May 30 in Hollywood! This is the source of my current FB profile photo with hashtag #Goddess ~ and is all about women REclaiming words in powerful ways…together, let’s REspect, inspire, empower & celebrate women all around the globe! — at LA MOTHER. Performing, curating & co-creating at this event…email gaiagrove@gmail.com to get involved!